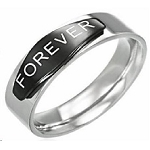 Guys who want a completely "different" look in a wedding band be attracted to these mens black rings. 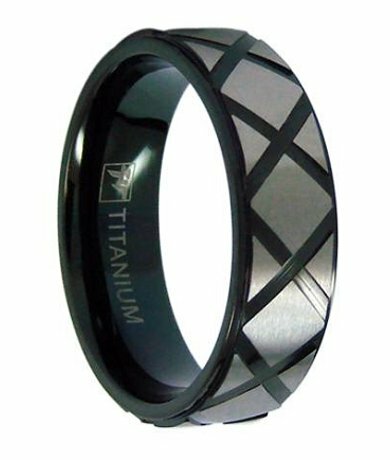 A glossy black ring is embellished all the way around with an "X" pattern of brushed titanium. A comfort-fit interior adds to the allure of this unique 7mm ring. The ring came super quickly and was a great price! It's very light and looks great on my fiance's finger! The only problem is that it's not sold in half sizes, so we had to go up a half size and it's a little big, otherwise I would definitely recommend this item! Very happy with my purchase and really appreciate the customer service. I had to exchange my first purchase because I ordered the wrong size. No issues and got my new one quickly. the standard shipping was very quick. I had the ring within 3 days of ordering it. It is a beautiful ring and a nice thickness. It doesn't look or feel cheap or junky. I know my husband will love it.